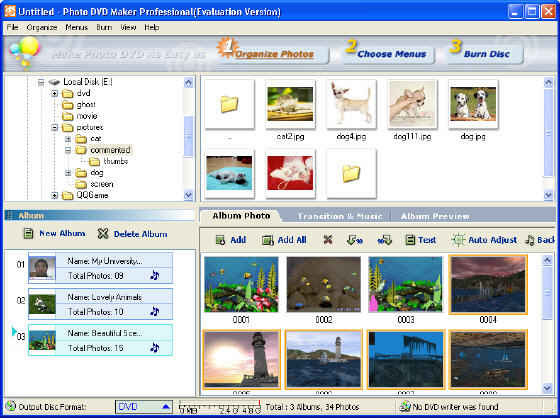 In the first step, you may create photo album and select picture from a folder on your hard drive and add them to a particular album. In the first step, you may also add music and transition effects to your slideshow. When clicking the Music & Transition Effects tab, you may add background music and select your desired transition effects from more than 260 amazing special transition effects. You may also apply Pan & Zoom effect to your creative works. The Preview window gives you ideas of how your slides will show on TV with DVD player. You can preview the finally effect just like in the real TV.